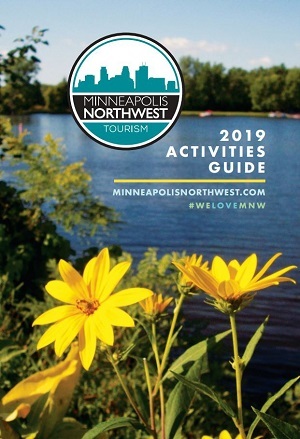 Minneapolis Northwest is full of awesome parks, but if you haven’t been to Central Park in Maple Grove, you’re seriously missing out. This park shines all year long. On any given day you’ll find children laughing and playing on the slides, climbing walls and running off their excess energy. Parents are close by relaxing and enjoying their time. You might spot people walking on the trails, enjoying a picnic on the lawn, or playing pickleball on the dedicated courts. So it comes as no surprise that Central Park won an Award of Excellence from the Minnesota Recreation and Park Association! MRPA gives this award annually for new parks and facilities that made a significant impact on the community, exhibit exceptional planning, and demonstrate uniqueness and originality, which Central Park has plenty of. But then winter rears its head, and Central Park is still one of the best places to visit in Minneapolis Northwest. Thousands of locals and visitors have enjoyed its rolling green lawn, the playground (from your childhood dreams), the LED illuminated splash pad, and of course, the ice skating loop in the winter! The loop is actually a trail, not like your tired old rink with bad texture. It is 800 feet of spectacular ice skating (one lap around a hockey rink is only 570 feet). And it’s refrigerated and is maintained by a Zamboni, so you can live out all of your professional ice skating fantasies without any bumps in the ice. No promises on what you’ll look like living out said fantasy though. There aren’t many loops or trails like this in the country, so you need to take advantage of it while you’re here! Rent skates and feel like you’re strolling through the park (but skating), go inside and warm up with concessions, and revel in the beauty of a Minnesota winter. There’s nothing quite like it. Get out there and enjoy Central Park in the winter! If you need more ideas, just let us know. We’ve got plenty.